CoLab Radio » Blog Archive » What are the greatest opportunities for change in cities? This question is on a CoLab Radio postcard. You don’t need a physical card to answer the question. If you have something to say, use comments section below this post. Cities are changing fast, posing risks and create opportunities for innovation. Engaged scholars together with community activists can help to understand change in cities and improve policy and planning outcomes. What kind of research is helpful? What are some of the challenges scholars and community activists working together face? CoLab and U.R.B.A.N. (Urban Research-Based Action Network) want to know. CoLab distributing this particular card at the 2011 Urban Affairs Association conference in New Orleans. Any person, group, or institution can ask a postcard question. 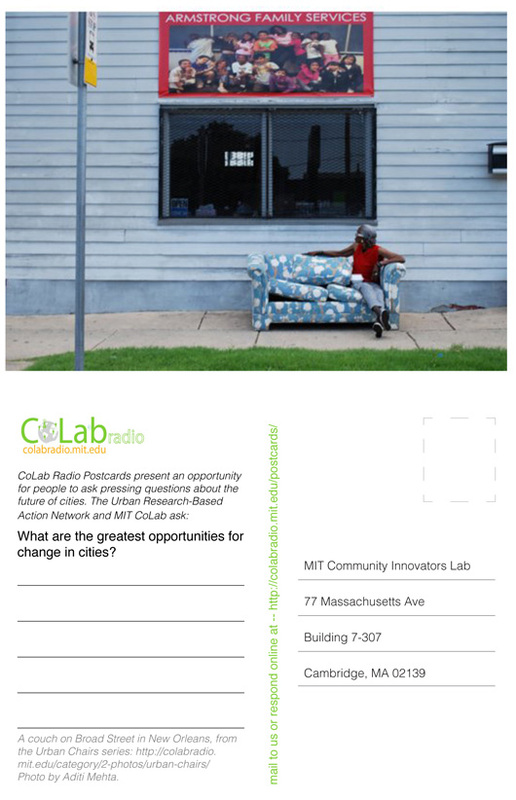 Email colabradio@mit.edu if you would like to make one. I think a city’s youth population is the greatest opportunity for change…it is these young people’s values, visions, and talents that will shape the places they inhabit.